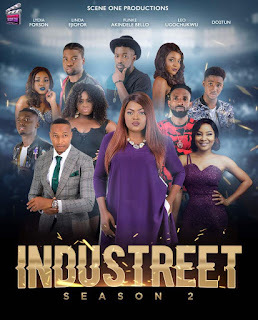 Scene One Productions has finally premiered Season 2 of the much-anticipated TV Series, Industreet, created & directed by JJCSkillz and produced by Ace Nollywood Actor, Funke Akindele Bello­­­–who also owns the production outfit. After season 1, which ended with massive cliff-hangers, left viewers playing scenarios in their heads, guessing what happens next on the hit drama series, Industreet season 2 promises to top the performance of the previous season, answering questions left unanswered and keeping fans yearning for more with top notch performance from its star studded ensemble including Funke Akindele Bello, Linda Ejiofor, Lydia Forson, Kunle Coker, Leo Ugochukwu, Daddy Freeze, Kay Switch, Charles Okocha, Ushbebe, Jaywon, Gemstones, Mo Eazy and OAP Dotun. Watch Industreet season 2 exclusively on SceneOne.tv and the SceneOneTV mobile app. SceneOneTV app can be downloaded from both the Apple App Store & Play Store for Android users.